Say "Ave!" to Qvadriga – a peculiar action-packed racing game, which got released for iPads and Android tablets recently. It is set in Ancient Rome and allows you to race with... chariots. Well, the video games that revolve around the chariot racing theme could be counted on the fingers of one's hand, but that's not the most unusual aspect of Qvadriga. In fact, what sets the game apart from the competition even more is that it is also a turn-based strategy game. In Qvadriga, you take control of a racing chariot, which is "powered" by four horses. Each race consists of several laps and you will stand up to a number of brutal rivals, usually 7. After you select your charioteer and line up on the start line, you wait for the signal and set off, similar to any other racing game there. And this is when the fun begins - the gameplay mechanics of Qvadriga will pause the game each 2-3 seconds and allow you to interfere in the race by issuing commands to your chariot. You can whip your horses and gain some extra speed, guide them left or right, pull the reins to slow down the chariot, or even attack your rivals with the whip. Still, a more dynamic players can choose a more dynamic gameplay mode, which does not automatically pause the game, but still allows them to control their chariot. Your rivals will do their best to cross the finish line first and won't hesitate to kill you if they have the chance. That's right, just like in Ancient Rome, the chariot races in Qvadriga usually leave a participant or two rolling on the dust with their intestines all out. You'll have to carefully plan your strategy for each race and act accordingly to what's happening during the race. In this line of thought, you also have to upgrade your chariot, horses, and charioteer in order to remain fairly competitive. Although Qvadriga might not appeal to the average gamer, it seems like a pretty interesting take on the racing genre, which borrows a lot from the turn-based strategy genre. 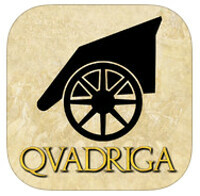 If Qvadriga sounds like your cup of tea, you can get it on your iPad or Android tablet for $9.99. No word if it will arrive on other devices, though. I thought this is 2014.